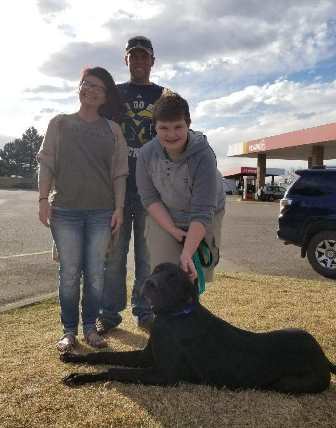 Zeus has a home with his new family Leslie & James and their two children Daniel and Alexis in Grand Junction, CO! Zeus will be the family’s first Great Dane, but with their friends and co-workers owning Danes, he will most likely have some Dane friends to play with. He will be sharing his home with Lucky, a 7 year old Bichon, and Huxon, a 2 year old cat. Leslie loves to walk and jog, so Zeus will be able to get some of his puppy energy out by keeping her company on her outings. He will also be joining the family on many outdoor activities, and playing fetch in his new back yard. We are so happy for this sweet puppy! Way to go Zeus!